Join us for an evening of networking and the opportunity to talk with like-minded professionals in an informal setting. 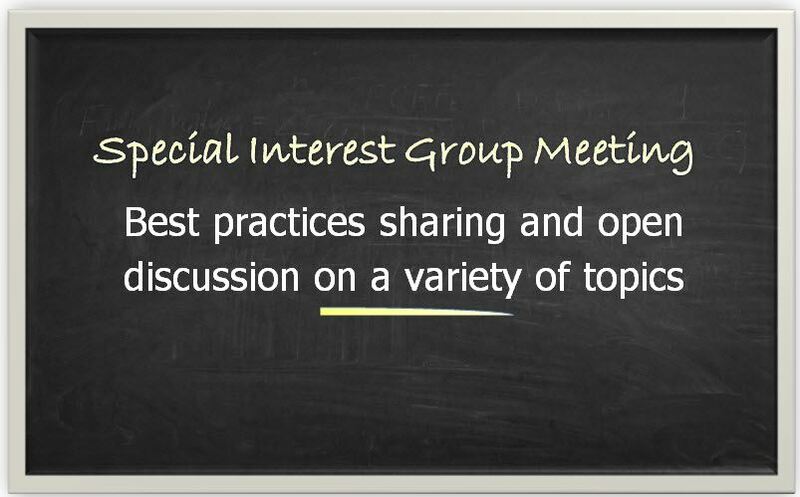 Special Interest Groups (SIG) are designed to give you an opportunity to share best practices, business challenges and learn from others. This is a gathering of people with similar interests together in an informal, friendly peer group setting, facilitated by you and your peers. This SIG is unique because there will be topics running concurrently. You will have the chance to participate in 1 or more groups throughout the evening – the choice is yours! Companies are continually trying to improve an employee’s first weeks on the job with the goal of creating long-term employee success. In this session you will discuss and share employee onboarding process challenges and best practices. Technology is moving so fast and it is changing the way we learn and grow. How are you using technology to develop and deliver training? Are there tools you struggle with or ones you think everyone should be using? Come to this session and discuss the latest technology trends and share what is and is not working. Josh Bersin in a recent Forbes Leadership article wrote, "Is 2016 going to be the year of diversity in business?" He also answered the question writing, "I believe the answer is yes: this topic has been raised in the public eye and research now proves that companies with great diversity outperform their peers by a significant margin. If you aren't taking this topic seriously you should be..." and Lydia Dishman wrote in Fast Company that "Diversity and inclusion are more than just buzzwords or boxes to check. Millennials believe they are essential to business success." is your organization on the continuum? Come and learn or come and share your expertise with others. Join in the discussion! No walk-ins are allowed, as there is security to get into the parking lot and the building. Registration will close Monday at 11 am. You must arrive between 5:30 - 6:00 or you will not be allowed in by security. No food will be provided but you can bring your own snack.